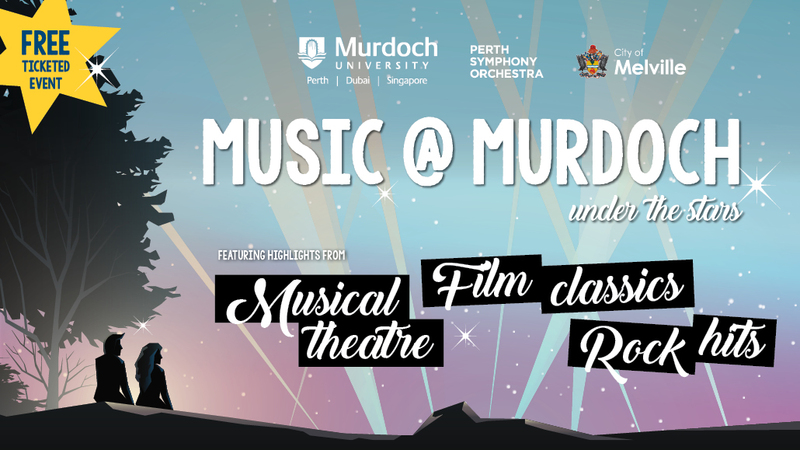 Perth Symphony Orchestra | Music @ Murdoch returns! It’s back! Music @ Murdoch returns in 2017 following a hugely successful concert where over 3,000 free tickets were snapped up to hear PSO in action in the stunning surrounds of Murdoch University’s Bush Court on Sunday, February 19. Premium Reserve tickets are still available from the link below. Musicians from PSO will accompany special guest singers to perform a feast of musical theatre, film classics and rock hits. Support acts will include Murdoch University student Kathryn McCarthy and Australian idol finalist Chris Murphy. The gates will open at 4.30pm, with free parking and a food circus provided by Hawaiian. said Bourby Webster, founder and Executive Director of PSO. City of Melville Mayor, Russell Aubrey, said the City was delighted to support the event again this year. Support for the event comes from the City of Melville, AHG and Hawaiian. Members of the public will be allowed to book up to four general admission tickets for the event.